Pet Litter Box Cabinet is the perfect way to conceal a cat’s litter box. The dark mahogany color and stylish details, including antique-brass colored pull knobs, go with any décor. 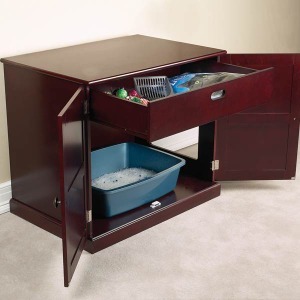 Fits standard-size litter box while offering cats ample room and privacy and containing mess and odors. Two paneled doors, with magnetized closures, make box removal and maintenance easy. 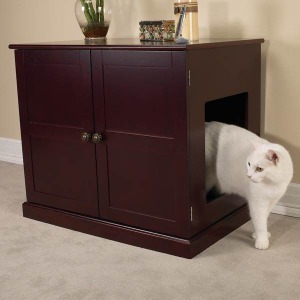 Side opening allows cats discrete entry and exit. 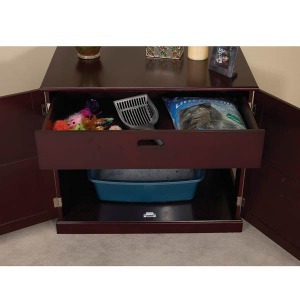 Includes storage drawer (for extra litter and a scoop--not included). Boxed with instructions for assembly. 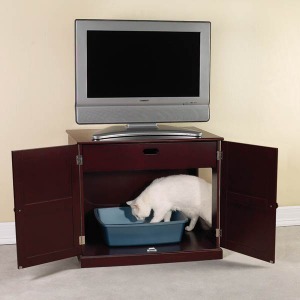 Assembled Litter Box Cabinet measures 28" W x 19" D x 24" H.